In my hometown of Redding, CA, there is no shortage of talented musicians of many genres. Much to my own dismay, our metal scene has been lacking for several years. Not for lack of skill, or drive, or determination from bands that have attempted. For whatever reason, it just hasn’t really taken off in our area of NorCal. However, a shift has started happening. A few bands have started to rise and gain some notoriety. Producing studio-quality albums and branching out to shows beyond the foothills. One such band making this shift is The Anima Effect. 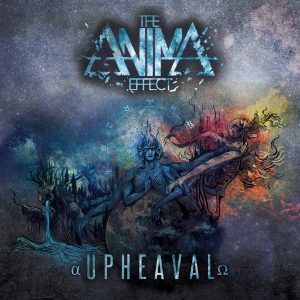 A hard hitting, symphonic style progressive metal band that formed in earnest in April of 2017, with their debut release “Upheaval”, released on November 16th, 2017. Hard hitting riffs, overlaid with melodic guitar sweeps are the most prominent features of this bands sound. Over the course of this album you’ll feel as if you’re being grabbed by the shirt collar and thrown into a ballroom dance, only to be spun back out into the mosh pit. This epic collection of music is incredibly impressive for a group of young gentlemen from a podunk city in rural California. A few things did catch my attention in a less than enjoyable way. A few of the tracks seem to end abruptly, as if the track had no logical finish and was produced to a finish that doesn’t fit with it’s outro. The biggest example being the interlude in the middle of the album, “Nexus”. The song in itself is beautiful, with a driving repeated melody to keep the rhythm, while allowing the bottom end of the band to showcase their abilities. Yet, it feels forced into the album, with a sudden start that gives the listener an awkward jolt. As the outro flows out and slowly quiets, the next song suddenly drops in volume with an intro that seems to completely ignore the last three minutes of build-up. Some parts also appear to be written simply for the sake of being technical. While musically difficult, and an amazing show of each musician’s control of their instrument, they come across as more of an angry swarm of bees. These misgivings are short-lived, though, and do not detract one from the overall feel and quality “Upheaval” has to offer. Besides, these misgivings are things every band, big and small, are guilty of at some point. “Upheaval” is ambitious, and bit risky for a breakout band. It’s certainly not the easy-listening type of metal one throws on in the car as they travel around town for a day of shopping (well, at least most of us don’t). This album is complex, engaging, and thought provoking. It’s the kind of album you put in the morning to get your brain moving as you sip your morning coffee and prepare for the day ahead. Having this be the focus of a band or album is not bad in the slightest of ways. It shows an incredible amount of musical maturity, as all these qualities are ones you would associate with artists like Miles Davis or Dave Brubeck rather than a group of young metal heads in the late 2010’s. Progressive, technical metal has never been known to have the broad appeal to the masses as some of the others. Yet, art and music are about taking risks, as it’s the only path to true innovation and new territory. The Anima Effect has set themselves on a climb with a steep grade to tackle. Yet, they seem completely ready for this climb. Writing and releasing the album is only half the battle after all. A band has an endless amount of legwork afterwards. Booking gigs, travelling to gigs, getting your album to the people who want it, pushing merch, networking, and countless other menial tasks that are absolutely essential to the success of an album. The gentleman of the Anima Effect have this drive. They’ve worked tirelessly before and since to establish the network needed to get “Upheaval” to listeners. In all seriousness, the determination to go through with this part of an album cycle is what makes or breaks bands. The Anima Effect has this determination, and are set to begin playing shows late January 2018 throughout Redding and beyond. “Upheaval” is a brilliant and mature collection of music. It has a polish and craftsmanship that I have not seen from a band in this area in quite a long time. I hope that this is the beginning of something special for this band, and our area as a whole. As more bands like them and a few others that have caught our attention here, we may finally have as foundation for a burgeoning metal scene in our area. They certainly have my full support and goodwill in this endeavor, as I plan to go see them at one of their upcoming shows. If you’re in the Redding area and love metal, I hope to see you there too.